Elizabeth Harris, Director of InSight Gallery, has revealed her selections for the winners in the PleinAir Salon bi-monthly art competition. Congratulations to the winners of the February-March 2019 PleinAir Salon! The 1st Place Overall winner is shown above; keep scrolling to see more winners and learn how to enter your best paintings and drawings today! View the rest of the PleinAir Salon winners at pleinairsalon.com/winners. Note: Judges are not provided with contestant names. The April-May PleinAir Salon, judged by gallery owner and curator David Ethridge, has begun. But hurry, this competition ends on May 31, 2019. Enter your best art in the PleinAir Salon here. First place will receive a cash prize, plus all winners will be entered into the judging for the annual cash prizes, including the $15,000 grand prize for the best painting of the year. Could you be the next winner of the $15,000 grand prize or one of many cash prizes? 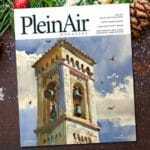 Plus, as the grand prize winner, your painting could be on the cover of PleinAir magazine.